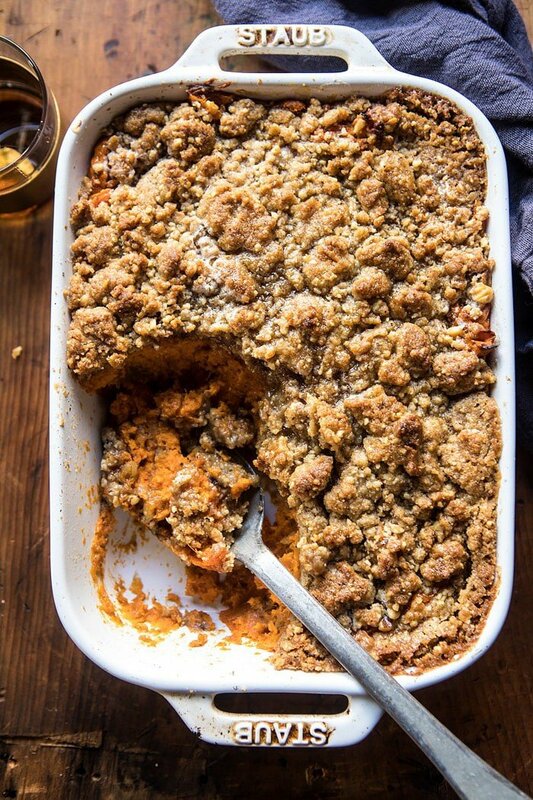 Cinnamon Streusel Swirled Maple Sweet Potato Casserole. Cinnamon. Streusel. Swirled. Maple. Sweet. Potato. Casserole. The BEST. I don’t often share many side dish recipes with you guys. I don’t know why this is, because side dishes are delicious, but for whatever reason I almost never do…that is except in the month of November, when sides absolutely need to be discussed. I came across this Huffington Post article that actually broke down what the most loved Thanksgiving side dishes are. To my surprise, stuffing came in first, followed by mashed potatoes. I for sure thought mashed potatoes would have beaten out all other sides, but then I don’t like stuffing all that much. However, I do love mashed potatoes, and of course, sweet potatoes. Sweet potato casserole came in third, but you guys, I don’t know, I’m thinking it needs to be higher up on the list. It might just be my personal favorite Thanksgiving side dish. Every Thanksgiving I love putting a slightly new spin on the classic sweet potato casserole. 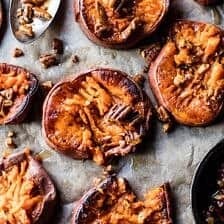 In years past I’ve done sweet potato casserole boats, bourbon sweet potato casserole with sweet ‘n’ savory bacon pecans, lighter sweet potato casserole, and roasted sweet potatoes with maple butter. This year, I wanted something a little more classic, but with my own little twist…or two. 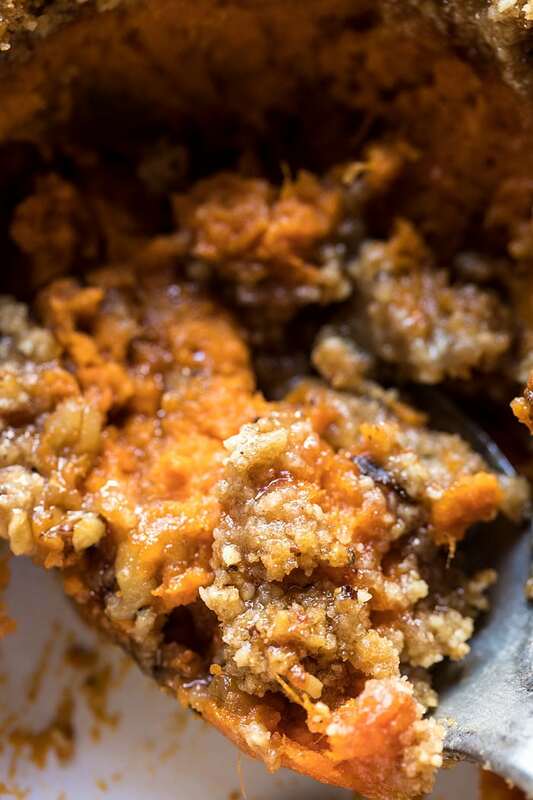 This sweet potato casserole is everything. Sweet, but not in an intense, can’t take more than a few bites way. It’s light, buttery, and swirled with the most delicious cinnamon streusel, that makes this casserole the best! 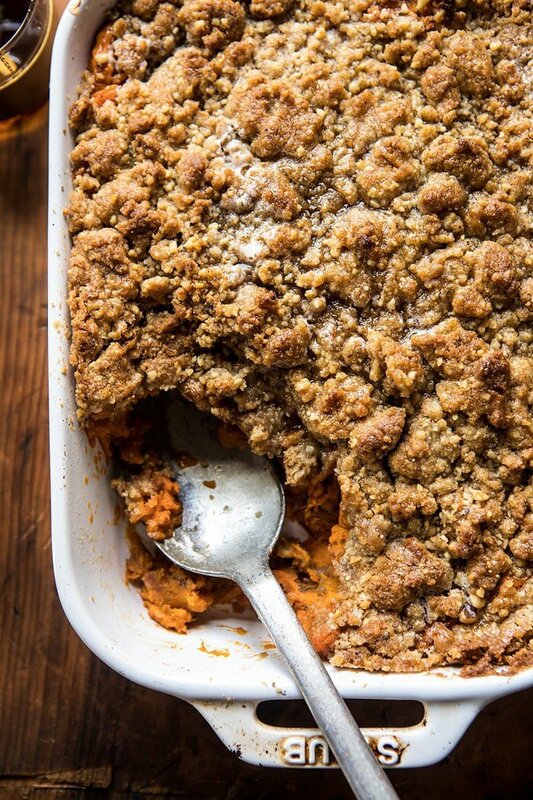 If you love any form of sweet potato casserole, and you love cinnamon, you clearly need to make this recipe. 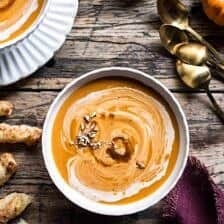 The sweet potatoes themselves are a simple mix of roasted sweet potatoes, whipped up with a touch of maple, cinnamon, vanilla, browned butter, and a little heavy cream. I like to whip the sweet potatoes a bit to ensure they are light and airy before baking. Simple, but good. What I’ve never been able to understand, is why no one adds cinnamon to their sweet potatoes. This is something my grandma always did and it’s something I will carry on. When creating this recipe, I thought of the streusel from this pumpkin coffee cake. I got to thinking, “why not make the casserole kind of like a coffee cake and layer the streusel throughout the dish?”. It seemed like a pretty smart idea, so I went with it, and you know, it turned out pretty good. Just like a coffee cake, I did a layer of streusel in the center and then another layer on top. Meaning, buttery, cinnamon goodness swirled throughout the entire casserole. And then, as if all this streusel business was not enough, I finished off the top of this casserole with a drizzle of browned maple butter. I mean, I figured it’s Thanksgiving, go big or go home, right? I can’t believe that today’s sweet potato casserole is one of the last few recipes I’ll be sharing as a part of my 2017 Thanksgiving Menu! So hard to believe Thanksgiving is almost here. I only have a few more recipes to add and then it’s go-time. How are everyone’s menus coming along!? I’m spending this week preparing content for the next couple weeks on HBH. Heading to Cleveland in a week, so lots of running around, cooking, and plenty of holiday shoots happening this week! Lastly, all you Colorado readers, I’m doing a book signing in Edwards at the Bookworm of Edwards tomorrow night. The signing starts at 6pm and there will be plenty of food from the cookbook. I’ll be there demonstrating how to make one of my favorite appetizers, pan-fried feta with marinated olives. It’s going to be a fun and delicious night. Can’t wait to meet some of you! Just like a coffee cake, this casserole has a layer of streusel in the center and another layer on top. Meaning, buttery, cinnamon goodness swirled throughout. 1. Preheat your oven to 400 degrees F. Grease a 9x13 inch baking dish or a dish slighly smaller (no less than 2 quarts). 2. Poke a few holes in the sweet potatoes and bake for 1 hour or until soft and tender. When the sweet potatoes are cooked, slice them in half and allow to cool. Reduce the oven temperature to 350 degrees F.
3. Peel the skins away from the sweet potatoes and mash well in a large mixing bowl. 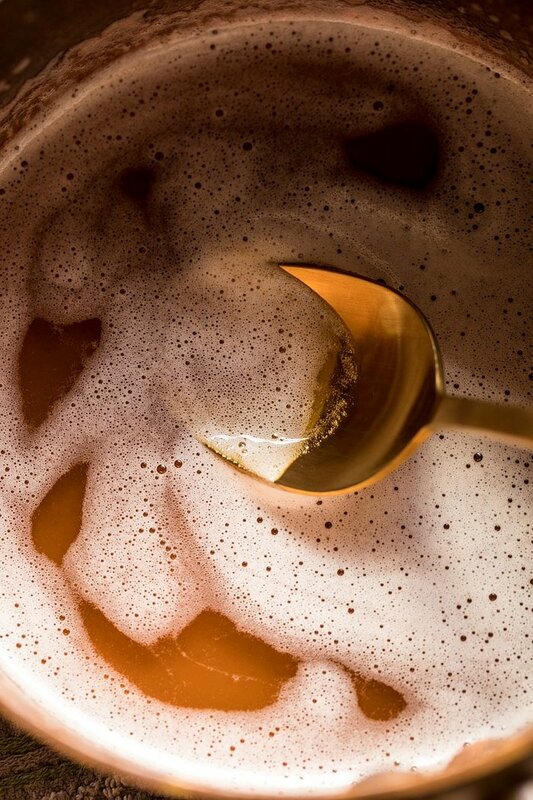 Mix in the maple syrup, vanilla, cinnamon, heavy cream, butter, and eggs, mixing until combined. 4. To make the streusel. In a medium bowl, combine the flour, brown sugar and cinnamon. Add 6 tablespoons butter and use your fingers to mix the butter into the flour until a crumble forms. Stir in 1/4 cup maple syrup and the walnuts. 5. Pour half the sweet potatoes into the prepared dish. Sprinkle with 1/3 of the streusel. 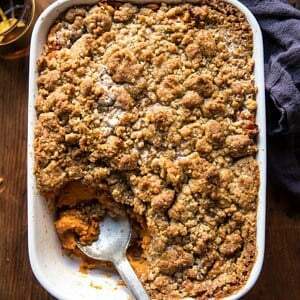 Spread the remaining sweet potatoes over top and sprinkle the remaining streusel evenly over the top of the sweet potatoes. Transfer to the oven and bake for 30-40 minutes or until the top is dark golden. 6. Meanwhile, in a small sauce pan, brown the remaining 2 tablespoons butter over medium heat. Stir in the remaining maple syrup. 7. Just before serving, drizzle the browned maple butter over the casserole. Serve warm. Mmmmmm, do you see that streusel though? Streusel is always a good idea…always! 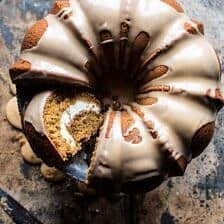 Cream Cheese Swirled Brown Sugar Pumpkin Coffee Cake. SO glad you shared this side dish recipe – streusel mandatory here, for sure. Happy Monday! Can this casserole be made without eggs? I have an egg allergy in my home. Sweet potato shuffle is one of my favorite dishes. My mom always added crushed pineapple and coconut to hers. I usually ate it for my dessert. Can no do this year though…eating low carb. OOPS!! That would be souffle. The computer kept changing that to shuffle. No wonder I didn’t notice it. Crazy! Pineapple and coconut sounds really yummy! I hope you have a great Thanksgiving Charlotte! This looks fantastic. I also love cinnamon! I was wondering what size pan you used…looks smaller than 9×13. BTW, I’m doing Mac and cheese instead of stuffing this year! HI! I use a 9×13 inch! Photos can lie a bit…lol. Enjoy the mac and cheese and this casserole! Hello. Is this a dessert or a side dish?? 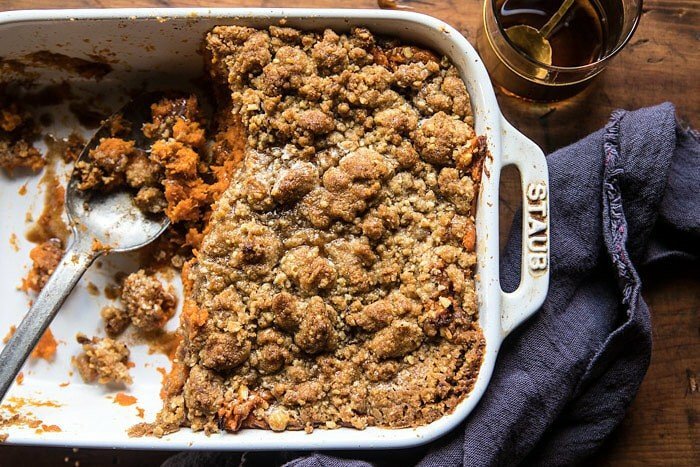 In my country streusel, cinammon and vanilla are dessert-ingredients and would never end up near a turkey 🙂 Many of your recipes have a sweet touch, is this typically American or just Tieghan-style? Waiting for some 100% savory dishes. Your work & photos are awesome. It’s a little of both! 🙂 Thank you! How far in advance could you make this? The night before? Looks amazing, How many servings does this recipe make? I’m going to make this for Thanksgiving. It looks so yummy. Thank you for something need to make. Thank you!! I hope it turns out amazing for you! 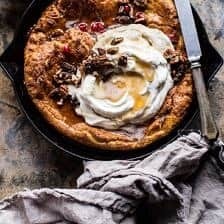 This dish looks amazing, and I’m definitely interested in adding it to my Thanksgiving menu! – What size dish did you use / how many servings are in this recipe? – Can this be made ahead? Also, is this a side dish, or a dessert?? Thank you for updating the recipe!!! This sounds positively yumalicious!! I’m going to make this, but must use a gluten free flour substitute because of my daughter’s Celiacs Disease. Do you think this will ruin the streusel? This is the first big holiday dinner since her diagnosis and I want to make it every bit as special as usual. Thank-you for your always delightful recipes and magnificent photos. Yum! I may make this as a breakfast dish. Question: what do you consider medium size sweet potatoes? Enough for about 3 cups of cooked/mashed potato? Silly question….As for your scrumptious Crockpot 3 Cheese Mashed Potatoes, I will be making this at our house, and then taking it to another house for Thanksgiving. After it’s cooked, should I place it in a bowl, and re-heat in microwave at their house, or take the whole crockpot over to stay warm? I am so happy you like this! I bet the sweet potatoes with the nut butter is amazing.. sounds so yummy! I hope you love this recipe Kristin! You may need to add the total time to prepare again. My math says 1 hour, 50mins. Hi Karen! The cooking time for me at a higher altitude is different so I do my best to try to get it accurate for everyone else. I’ll look into the times! Thank you! I am going to try this next Friday as my birthday dish to all my friends.Thanks for sharing. That sounds great! I hope you and your friends love it! Happy Birthday! I made this tonigt for my husband’s work potluck and it didn’t come out at all like your picture. I used a 9 x 13 pan and there just wasn’t enough streusel to cover it all up like yours. Followed the recipe exactly. Hope they’ll like it tomorrow. Well, they loved it and several of the gals asked for the recipe. Maybe I’ll double the steusel recipe next time. That is amazing! Thank you! Yes please to cinnamon streusel swirled! I’m obsessed! So happy you’re loving this! Thanks! I want to make this for Thanksgiving. We have a family member with a nut allergy. If I make the streusel without the walnuts will it still taste good? Could I substitute a seed (i.e. toasted and chopped sunflower seeds or toasted/chopped pumpkin seeds)? Thank you for your help. I made this on a trial run before the real family Thanksgiving this week and loved it. I substituted pecans for walnuts as the family has a walnut allergy. My only two suggestions would be to maybe add a dash of salt to the potatoes for balance and to whip up the potatoes for a creamier texture, but otherwise this was perfect! I plan to 1.5x the recipe this Thursday and can’t wait to take it to Thanksgiving. Thanks for always having such great recipes. I am so glad this turned out great for you Paige! Thank you & I hope your family enjoys it on Thanksgiving! This looks incredible! Will definitely make it for thanksgiving or christmas this year. Thanks for sharing! I hope you love it! Thank you Alexandra! so this recipe looks great but I’m a little confused. It says that it should take an 1 hour and 15 minutes to make but when I’m reading the instructions it says that it takes 1 hour to make the sweet potatoes and then another 40 minutes to bake the pan after the topping is but on? Am I reading something incorrectly? Agreed! Need to make more streusel to cover the top. I am so glad! Thank you Shazlynn! Delicious! I would recommend making more streusel if you want it to cover the entire top of the casserole. I made this for Thanksgiving dinner and it was a huge hit! The sweet potatoes are not as sweet as other recipes given the replacement of white sugar with maple syrup. In fact, I’d describe it as the perfect amount of sweet. Thank for a fabulous recipe which will become a new family tradition. I am really happy you liked this recipe Cathy! Thank you!! Made this for Thanksgiving and it was very tasty! The one thing I will say is that the recipe for the streusel is written confusingly – some of the maple syrup and butter needs to be saved for the maple butter but that wasn’t very clear, so we mistakenly put too much butter into the streusel, which made it very sticky – added a little more flour and even some oats to try to make it more of a crumble but it was never really a crumb topping texture. I’d recommend writing out the brown butter maple as a separate sub-recipe… thanks for sharing! Hi Amy! I am so glad you enjoyed this recipe, but I am sorry the directions were confusing! Thank you for letting me know! Hi, I’m making this dish for a work potluck tomorrow night. I know you’ve already said that it is okay to be kept in the fridge for several days before baking, but could I bake it tonight/tomorrow morning and keep it in the fridge until reheating for the potluck? If so, how would you recommend reheating it – just put in oven with foil over it? Thanks so much! This is the only way I will make my sweet potatoes for now on. I made them for Thanksgiving and my kids bragged about them. So I have to make them for Christmas Eve and Christmas Day. Thanks for sharing. That is SO great! Thank you Christina! This looks amazing! Can you make this a day or two ahead and just reheat in the oven? can you add marshmallows to the top? This recipe looks awesome! Can’t wait to try it. 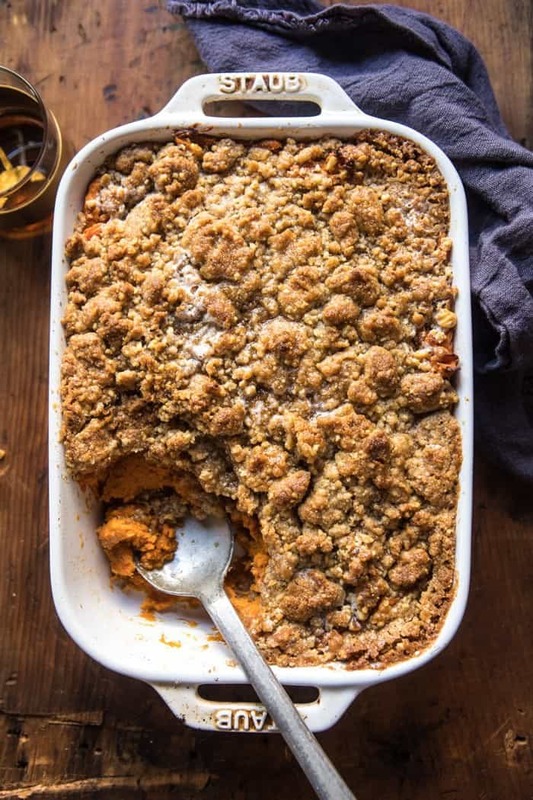 I am thinking of preparing the sweet potatoes and the streusel tomorrow (Wed) and putting in the fridge and then doing the final 30-40 minutes prior to our Thanksgiving meal. Do you think that would be ok? Also making your browned butter herbed mashed potatoes! Can’t wait.